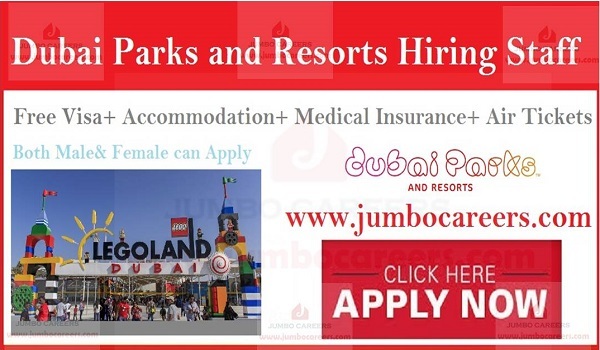 Middle East’s largest integrated leisure and theme park destination Dubai Parks and Resorts hiring Staff 2019 for Corporate office in Dubai as well as Legoland Dubai. Its a free and direct recruitment by the company. Attractive salary and best in class benefits given for selected candidates. About Dubai Parks & resorts: Dubai Parks and Resorts is the Middle East’s largest integrated leisure and theme park destination located on Sheikh Zayed road in Dubai, United Arab Emirates. Spread over 25 million square feet,it features more than 100 rides and attractions, and consists of three theme parks: Motiongate Dubai, Bollywood Parks Dubai and Legoland Dubai, and one water park: Legoland Water Park. It also encompasses Riverland Dubai, a themed retail and dining destination, as well as the Polynesian-themed family resort, Lapita Hotel Dubai.